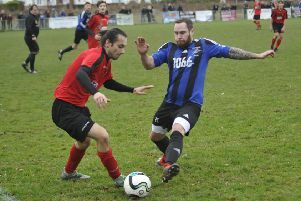 Bexhill United Football Club came from behind to record a third victory in its last four league matches. Jack Shonk’s first half double, which his took his tally for the season to eight already, gave the Pirates a 2-1 win away to Billingshurst in Southern Combination League Division One on Saturday. Bexhill made a very controlled start to the game, moving the ball well kicking up the slope with the two wingers functioning well, albeit without really getting in behind the opposition initially. Away goalkeeper Dan Rose made a fantastic reaction save at a corner from Billingshurst’s first real attack of note before the home side opened the scoring from their second. Craig McFarlane went up for a header near the byeline, but the ball struck his elbow and the referee rightly awarded a penalty. Although Rose guessed the right way, he was beaten by the power of Joseph Bagwell’s spot-kick. Light was delighted with the response of his players to going behind, as he has been throughout the season so far. Seemingly playing with more purpose, it wasn’t long before Bexhill were level. Connor Robertson found Shonk, who beat his man and drilled a shot from a tight angle which was too hot for the home goalkeeper and flew into the far top corner. Bexhill moved the ball from side to side extremely well and were getting the full-backs involved. Jack McLean was magnificent as he slalomed his way through the Billingshurst defence and the home goalkeeper was making some good saves. McLean danced into the area and was brought down for a stonewall penalty. With regular spot-kick taker Craig Ottley on the substitutes’ bench, Shonk stepped up and calmly dispatched the penalty to the goalkeeper’s left. Once Bexhill got in front, they never looked back. But despite fashioning plenty of openings - they had 11 shots on target in the first half alone - a third goal just wouldn’t come. Kicking down the slope in the second half, it was one-way traffic. Billingshurst’s goalkeeper kept his team in the game with several saves and when Bexhill did beat him, they were denied by a couple of goal-line clearances. And there was almost a sting in the tail. Billingshurst won a flurry of corners in succession near the end and from one of them Rose produced a great save to tip over a shot which was heading for the top corner. Nathan Lopez was outstanding throughout at left-back. Bexhill: Rose; Robertson, McGuigan, McFarlane, Lopez; Holden, J. Bunn, S. Bunn; Shonk, Giles (McEniry), McLean (Harley).